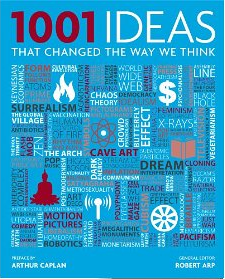 1001 Ideas that Changed the Way We Think - "Not-junk DNA"
Glenn Branch of NCSE alerted me to this book: 1001 Ideas the Changed the Way We Think. 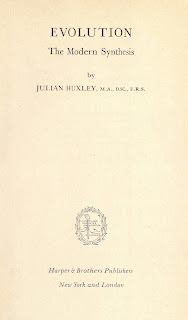 He wrote some of the articles [see Creationism and Evolution in 1001 Ideas]. The last great idea that changed the way we think (#1001) is written by Simon Adams, a "historian and writer living and working in London." Simon Adams thinks that the discovery that most of our genome is not junk counts as a big idea. To his credit, Glenn Branch realizes that this is somewhat controversial. That's putting it mildly. Knowledgeable scientists agree that most (~90%) of our DNA is junk in spite of what the ENCODE publicity campaign might have said back in September 2012. I'm reproducing the article that Simon Adams wrote to show you just how successful that publicity campaign was and how difficult it is for the corrections and rebuttals to make an impact on a gullible public. With apologies to Glenn, whose articles are probably accurate, you should not buy a book that makes such a serious mistake by allowing an amateur to write about genomes, a subject he knows nothing about. The ribbons of DNA (deoxyribonucleic acid) in our cells carry instructions for building proteins and thus continuing life, but it was long believed that stretches of them are useless. The idea of "junk DNA" was first formulated by the Japanese-American geneticist Susumu Ohno (1928-2000), writing in the Brookhaven Symposium in Biology in 1972. He argued that the human genome can only sustain a very limited number of genes and that, for the rest, "the importance of doing nothing" was crucial. In effect, he dismissed 98 percent of the total genetic sequence that lies between the 20,000 or so protein-coding genes. Yet scientists always thought that such junk must have a purpose. And indeed, a breakthrough in 2012 revealed that this junk is in fact crucial to the way our human genome, that is the complete set of genetic information in our cells, actually works. After mapping of the entire human genome was completed in 2003, scientists focused on the so-called junk DNA. Nine years later, in 2012, the international ENCODE (Encyclopedia of DNA Elements) project published the largest single genome update in Nature and other journals. It found that, far from useless, the so-called junk contained 10,000 genes—around 18% of the total—that help control how the protein-coding genes work. Also found were 4 million regulatory switches that turn genes on and off (it is the failure of these switches that leads to diseases such as type 2 diabetes and Crohn's disease). In total, ENCODE predicted that up to 80 percent of our DNA has some sort of biochemical function. The discovery of these functioning genes will help scientists to understand common diseases and also to explain why diseases affect some people and not others. If that can be achieved, drugs can be devised to treat those diseases. Much work still needs to be done, but the breakthrough has been made. The book was published on Oct. 29, 2013. That means there was plenty of time to read the critiques of the ENCODE publicity campaign and even the scientific articles that were published last winter and early spring. There's really no excuse for making such a mistake. We're in Washington D.C. for a wedding. Our hotel is the Ritz-Carleton in Arlington, Virginia, right next door to the Pentagon City Mall. 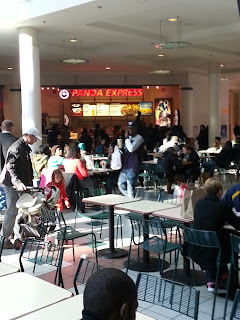 This is a photo of the food court in the mall. I was here with my children 20 years ago (August 1993) when I discovered "Panda Express" and orange chicken for the very first time. Of course I had to celebrate this anniversary by having some more. (I just finished.) I think that orange chicken is my number one fast food dish. I'm pretty sure that my daughter likes it too since she eats it at least once a week. 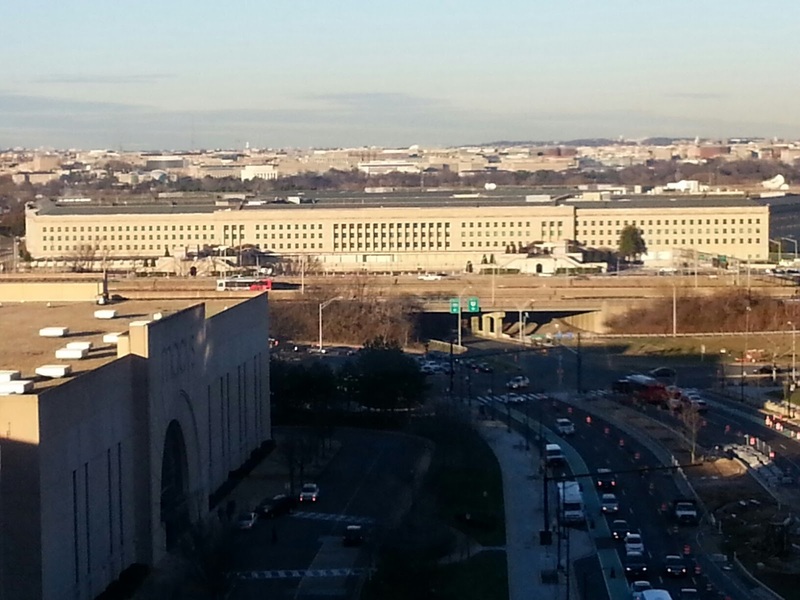 We have a nice view from our room of some big odd-shaped building. What do Intelligent Design Creationists believe? It's always difficult to pin down an intelligent design creationist. They demand detailed "naturalistic" explanations of everything before they will accept them but, on the other hand, they won't ever give you their explanation. For example, we know they have doubts about the evolution of bacterial flagella but have you ever heard them describe their hypothesis? Like who made the first flagellum? When? Why? It's also difficult to tell the difference between the various creationist cults. Clearly there are Young Earth Creationists who support the Intelligent Design Creationist movement but sometimes the IDiots say that YEC is inconsistent with Intelligent Design Creationism. Isn't that strange? Most IDiots define their movement in very broad terms but they get really upset with Theistic Evolution Creationists. Apparently, you can't believe in theistic evolution and still be an IDiot. Who knew? Now Granville Sewell comes to the rescue by describing what Intelligent Design Creationists actually believe [Granville Sewell: Intelligent design shouldn't be dismissed]. A link was posted on Uncommon Descent under the title "Introduction to ID." Here's the important part of Sewell's article. So what do ID proponents believe? Perhaps the best way to answer this question is to state clearly what you have to believe to not believe in intelligent design. 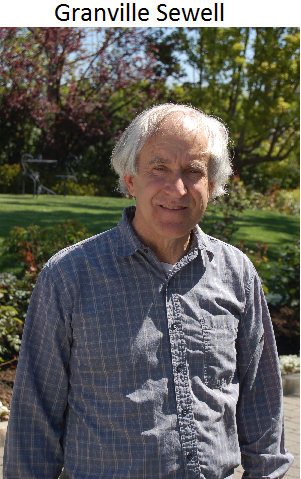 Peter Urone, in his 2001 physics text "College Physics" writes, "One of the most remarkable simplifications in physics is that only four distinct forces account for all known phenomena." The prevailing view in science today is that physics explains all of chemistry, chemistry explains all of biology, and biology completely explains the human mind; thus physics alone explains the human mind and all it does. This is what you have to believe to not believe in intelligent design, that the origin and evolution of life, and the evolution of human consciousness and intelligence, are due entirely to a few unintelligent forces of physics. Thus you must believe that a few unintelligent forces of physics alone could have rearranged the fundamental particles of physics into computers and science texts and jet airplanes. Contrary to popular belief, to be an ID proponent you do not have to believe that all species were created simultaneously a few thousand years ago, or that humans are unrelated to earlier primates, or that natural selection cannot cause bacteria to develop a resistance to antibiotics. If you believe that a few fundamental, unintelligent forces of physics alone could have rearranged the basic particles of physics into Apple iPhones, you are probably not an ID proponent, even if you believe in God. But if you believe there must have been more than unintelligent forces at work somewhere, somehow, in the whole process: congratulations, you are one of us after all! This is a very broad definition. If you believe in God then you pretty much have to be an IDiot unless you are a strict deist. Every single religious person that I know believes that "there must have been more than unintelligent forces at work somewhere, somehow, in the whole process. "1 Therefore, every Roman Catholic and every evangelical Christian is an IDiot, according to Granville Sewell. This includes Ken Miller and Francis Collins. In fact, it includes every religious scientist. For the record, I do not "believe" that " ... a few fundamental, unintelligent forces of physics alone could have rearranged the basic particles of physics into Apple iPhones." I think it's the most reasonable explanation. I don't know of any other explanation that is supported by evidence. 1. Yes, I know about atheist Buddhists. That doesn't count as a "religion" in my book. We had a big ice storm in Southern Ontario last weekend. There are still thousands or people without power and many are unlikely to have power restored before Christmas (tomorrow). We got off fairly lightly. We were never without power (underground wires) and the roads were cleared pretty quickly. 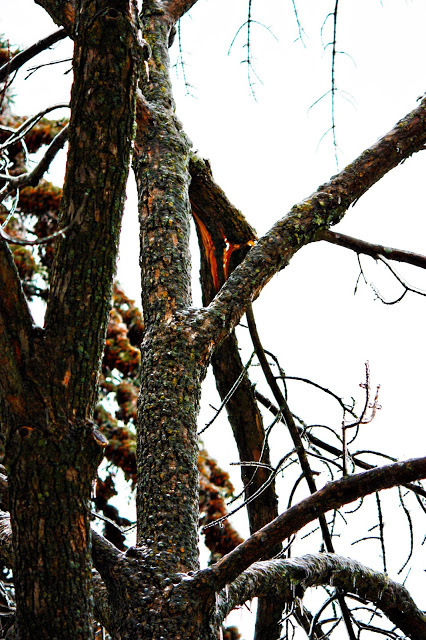 However, lots of trees in our neighborhood suffered and some were almost completely destroyed by the weight of the ice. A large branch of the ash tree in our front yard cracked but did not fall. It was hanging over our driveway so we had to move our cars. We called Davey Tree on Sunday and they showed up yesterday to remove the broken branch. It was quite a production. The woman in charge had to park this huge truck in our driveway and maneuver the cherry picker trough the branches. As you can imagine, it attracted an audience from the neighboring houses. When the job was done they swept up all the debris and turned it into sawdust in a wood chipper. There are more photos at: Uh Oh!. We have a daughter and a granddaughter who would love this job! I visited Finland for one day in August and now I can publish blog posts in Finnish! Seriously, Timo Kauppila has translated my Evolution Is a Fact and a Theory into Finnish and put it up on his BioLogiikka web site [Evoluutio on sekä fakta että teoria]. The Princeton Guide to Evolution is a collection of 107 articles on various aspect of evolution. The editors felt they should address the obvious conflict between evolution/science and religion. There are at least five different approaches they could have taken. An atheist perspective on the incompatibility of evolution/science and religion. Richard Dawkins or Jerry Coyne would be good choices. An atheist perspective on the compatibility of science and religion (the accommodationist view). Michael Ruse or Nick Matzke are obvious choices. A theist view of the incompatibility of evolution and religion. Phillip Johnson could have explained this view but so could a number of other creationists. A theist explanation of the compatibility of evolution/science as long as they stick to their proper magisteria. Francis Collins, Ken Miller, and several other religious scientists could present their case. The editors could have published four articles representing the main viewpoints or commissioned a single article that would have covered all the angles. The big advantage of an atheist perspective is that it fairly represents the views of a majority of evolutionary biologists. Having a theist write the article would not be as fair. I think we can all agree that option #5 is by far the best choice. Before reading any further, take a minute to decide what you would do if you were the editors of The Princeton Guide to Evolution. One of the problems in most debates and discussions in the problem of definitions. It's common for two opponents to end up talking past one another because they don't agree on what they are arguing about. That's why an important component of critical thinking is to define your terms so that everyone knows what you are defending (or attacking). But there's more. If you are going to be a good critical thinker, then you have to be aware of other points of view. If there are other, equally valid, definitions out there then you MUST acknowledge them and incorporate them into your argument. You can't, for example, just make up your own definition of words like "noncoding," "junk," or "function," and declare that you are right. Since you know that there are other definitions out there, you are obliged to show why YOUR definition is the only correct one. That's a crucial part of the debate. If you don't even know that there are other valid definitions then you are not an expert and you should not be pretending to be an authority on the subject. This is why I object to people who argue against the Central Dogma of Molecular Biology without understanding what Francis Crick actually said. Let's look at a video of Elliott Sober lecturing on "Some Questions for Atheists to Think About." He begins by asking the members of his audience whether they are atheists or agnostics. Apparently, most members of the audience are atheists and ony a few are agnostics. For any proposition, you should believe it only if you have evidence that it is true and you should disbelieve it only if you have evidence that it is false. He then goes on to show that we can never have evidence that God does not exist. Therefore, "If 'God exists' is untestable, you ought not to be an atheist. You should be an agnostic." He suggests that all the atheists in the audience should become agnostics because of evidentialism. If I had been in the audience, I would have pointed out that MY definition of atheist is that an atheist is someone who doesn't believe in god(s). My definition is such a common definition that it's part of the Wikipedia article on Atheism. Since I do not need "evidence" to not believe in something, I'll remain an atheist, thank-you very much. My position is perfectly consistent with the proposition about evidentialism. 1. I am not suggesting that Sober's definition is wrong. He should not be ignoring the fact that many members of his audience don't agree with his definition and that's why they are atheists. A few days ago, I asked the following questions, Is the "Modern Synthesis" effectively dead?, and What do they mean when they say they want to extend the Modern Synthesis?. The point I was trying to make was that there are many different views on evolutionary theory and it's often difficult to figure out which version of evolutionary theory someone is defending. For example, which version of evolutionary theory is compatible with the "selfish gene" as a metaphor for evolution? Or for adaptation? 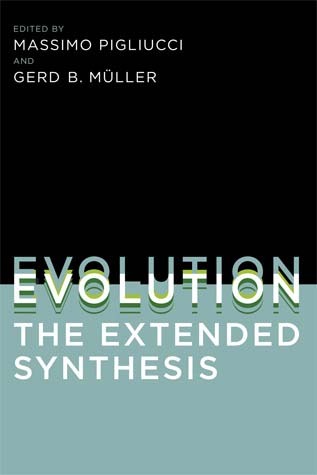 Which version of the "Modern Synthesis" is being attacked in the book edited by Massimo Pigliucci and Gerd Müller? Is it the version defended by Ernst Mayr? Does it incorporate Neutral Theory and random genetic drift? Here are the questions on yesterday's exam for students in my course. Students will be graded on their explanations and not so much on the actual answer they give. The idea is to reward critical thinking and that includes the ability to see both sides of an issue and recognize problems with whatever side you choose to defend. Assuming that the technology is safe and effective, should we, or should we not, have laws forbidding the cloning of humans? What is the best definition of a "gene"? 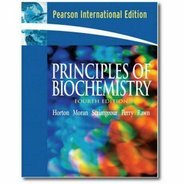 Explain why you choose that definition and give examples of possible "genes" that don’t fit your definition. Elliott Sober is a highly respected philosopher. He explains that theistic evolution is a reasonable hypothesis because God could easily cause mutations to occur in a way that scientists would not be able to detect. In other words, a specific, directed, mutation would be indistinguishable from a random mutation. Thus, it would appear that evolution was an entirely naturalistic process while, in fact, its direction was being guided by God. Do you think this is a reasonable argument in support of theistic evolution? Why or why not? In his book, The Myth of Junk DNA, Jonathan Wells writes. According to intelligent design (ID), it is possible to infer from evidence in nature that some features of the world, and of living things, are better explained by an intelligent cause than by unguided natural processes. What sorts of positive arguments do ID proponents use to support this inference from evidence in nature? Are they effective? Today is exam day and "You shall not pass"
Today is the day of the final exam in my course on critical thinking and scientific misconceptions. I thought my students would get a kick out of this photo. 1. 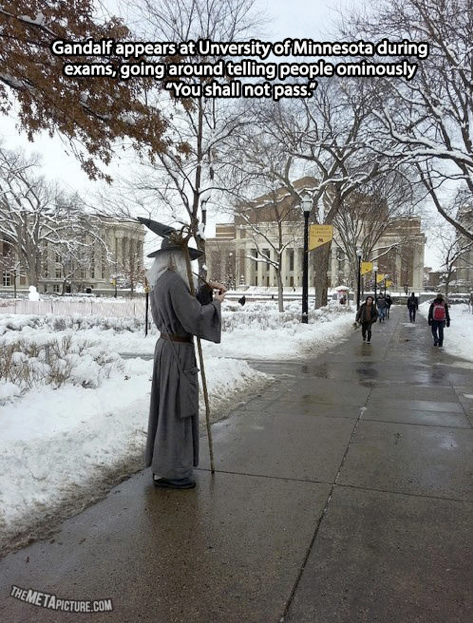 Note to IDiots and other creationists ... Gandalf is a fictional character, he doesn't exist. There are many fictional characters who appear to be powerful and menacing but that's only in stories and myths. Last week's molecule was the drug pantoprazole, a proton pump inhibitor used to treat excess stomach acid or acid reflux [Monday's Molecule #226 ]. The winner is Bill Gunn. This week's molecule (left) is related to one from last April. That molecule, is one of the essential molecules in the human diet and today's molecule is the reason why. This is one of those molecules that everyone should recognize because it's a key metabolic precursor in a large number of species. This is one of those times when all you have to do is supply the common name (Merry Christmas!) and NOT the IUPAC systematic name that correctly identifies the exact molecule shown in the image. However, if anyone wants to supply the systemiac name, feel free to do so. Email your answer to me at: Monday's Molecule #227. I'll hold off posting your answers for at least 24 hours. The first one with the correct answer wins. I will only post the names of people with mostly correct answers to avoid embarrassment. The winner will be treated to a free lunch. What do they mean when they say they want to extend the Modern Synthesis? As far as I'm concerned, the "Modern Synthesis" has been replaced by modern evolutionary theory that incorporates Nearly-Neutral Theory and random genetic drift as an important mechanism of evolution [see Is the "Modern Synthesis" effectively dead? ]. This extension, and replacement, of the 1940s version of evolutionary theory took place in mainly in the 1970s. If I'm correct, then why all the fuss in the 21st century about extending the Modern Synthesis? I think there are two things going on here. First, there are a bunch of biologists who want to incorporate their favorite fad into modern evolutionary theory. They think that their ideas are so revolutionary that this requires an extensive revision of evolutionary theory. Second, those biologists seem to have been asleep during the 1970s when the Modern Synthesis died so they are fighting a strawman. Is the "Modern Synthesis" effectively dead? 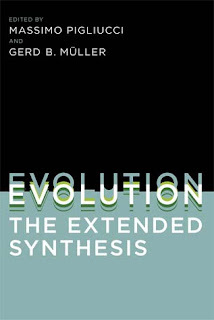 The "Modern Synthesis," or modern evolutionary synthesis, refers to a framework of evolutionary theory developed and promoted by prominent biologists in the 1940s. 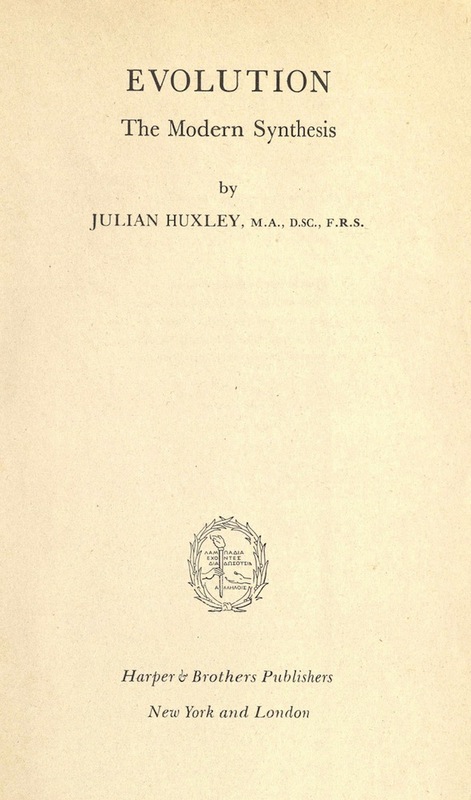 The term comes from the subtitle of a 1942 book by Julian Huxley. The central theme was the integration of "classic" evolution with population genetics. Although the original version was fairly broad, the later versions of the "Modern Synthesis" were much less so. The so-called "hardening" of the Modern Synthesis has been documented by many historians; notably, Stephen Jay Gould. By the time of the Darwin Centennial (1959) most biologists thought of the "Modern Synthesis" as a form of Darwinism + population genetics where natural selection was pretty much the only game in town. Chris Mooney thinks that humans have certain innate tendencies that predispose them to believe in god(s) and reject evolution. That's why there's such a strong correlation between a fundamentalist religious belief and rejection of science, according to Mooney. These innate tendencies are part of our evolutionary history thus providing an evolutionary excuse explanation of religion. It's interesting that these behaviors seem to tilt in favor of the Judeo-Christian gods and not Buddhist or Taoist philosophy. It's also quite interesting that million and millions of non-believers don't seem to have had any great difficulty "overcoming" their genetic predispositions. You don't suppose that it could be religious brain-washing education that makes people think teleologically or adopt essentialist perspectives rather than the other way around? And what about dualism? Is that an innate belief or does religion teach you to think you have a soul? Nah, that would be too simple [Why don't people accept evolution?]. Here's Hemant Mehta explaining why people Americans have a natural inclination to believe in god(s) and not in evolution [7 Reasons Why People Believe in God and Don’t Accept Evolution]. 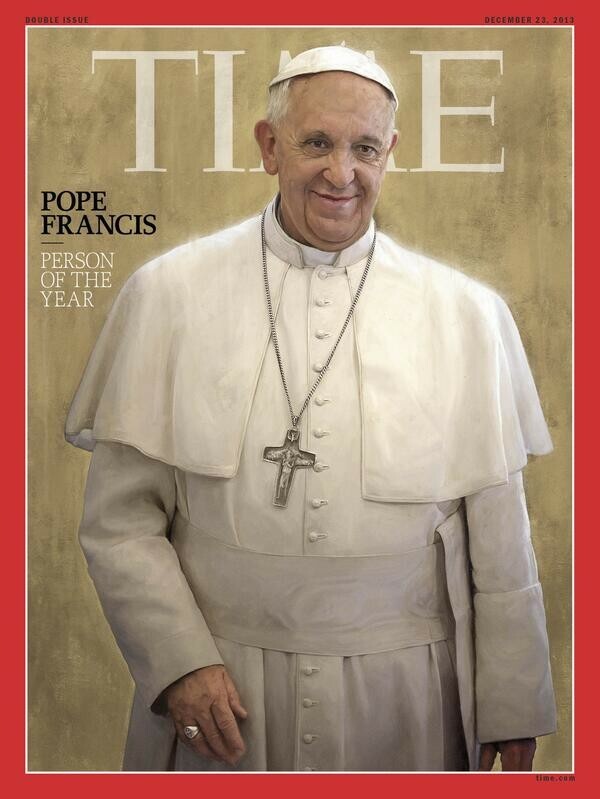 Time magazine's person of the year is Pope what's-his-name! WTF? It's hard to think of anyone who's more irrelevant to my life or the life of my friends and neighbors. Time has also become irrelevant. PZ Myers asks: Seriously, Time magazine?. Hemant Mehta says, Pope Francis Named Time’s Person of the Year, Despite Not Changing the Direction of the Church. What were the editors of Time thinking? You have to wonder whether this isn't some kind of sick joke. Razib Khan doesn't like Gould and doesn't like new-fangled ideas like "neutralism" and "random genetic drift"
The article by David Dobbs [Die, selfish gene, die] has stirred up a lot of biologists. Some of them (Coyne, Dawkins) pointed out why David Dobbs is wrong about this particular attack on Darwinian ordodoxy while others (PZ Myers) have defended Dobbs. Razib Khan has weighed in [Evolutionary orthodoxy may be boring, but it is probably true]. I strongly disagree with his post but it's important to be clear about the disagreement. If "evolution orthodoxy" means evolution by natural selection then, yes, it is definitely true. That's not being disputed. The question isn't whether evolution orthodoxy is correct, it's whether it is sufficient. I'm also not defending the specifics of Dobbs' article. Many of the most recent attempts to extend evolutionary theory are misguided and Dobbs happens to focus on one of these misguided attempts. However, the main point of Dobbs' article was that the "selfish gene" metaphor is an inappropriate metaphor for evolution and I agree strongly with this conclusion even though Dobbs' argument was faulty. Last week's molecule was sucrose 6-phosphate or α-D-glucopyranosyl-(1→2)-β-D-fructofuranoside 6-phosphate [Monday's Molecule #225 ]. The winner is Jean-Marc Neuhaus (again). He appears to be the only Sandwalk reader who has a copy of my book! Today's molecule (below) looks a bit strange. It should be obvious that this is not a "natural" molecule. What is it and what does it do? You don't need to give me a long systematic name. The common name will do quite nicely. Email your answer to me at: Monday's Molecule #226. I'll hold off posting your answers for at least 24 hours. The first one with the correct answer wins. I will only post the names of people with mostly correct answers to avoid embarrassment. The winner will be treated to a free lunch. 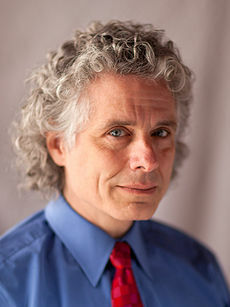 Jerry Coyne posted a couple of tweets (see below) from Steven Pinker (photo) at Dawkins responds to Dobbs. We shouldn't be surprised at the first one since Pinker is an evolutionary psychologist with a strong tendency to adaptationism. I don't know exactly what he means by "neo-Darwinism" (does he?) but I strongly suspect that it's very much like Darwinism. I'd love to know whether he thinks Neutral Theory and random genetic drift have been successful challenges to neo-Darwinism. If not, then it must mean that neo-Darwinism has incorporated those views. In that case, neo-Darwinism must have begun in the 1970s and somebody picked a very bad name for this view of evolutionary theory. I think it's more likely that Pinker is just not thinking about Neutral Theory and random genetic drift when he says that challenges to neo-Darwinism have all failed to hold water. The second tweet means that molecular biologists never knew about tRNA genes or ribosomal RNA genes or the genes for other RNAs that have won Nobel Prizes. I find this very surprising. It's true that some biochemists and molecular biologists are a bit behind in their field but I don't think it's fair to say that "molecular biologists" (i.e. the knowledgeable experts in the field) re-defined the word "gene" in that way. 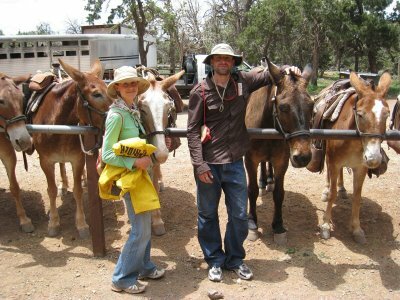 Last summer we took a short drive through the San Fernando Valley on our way from Thousand Oaks to Griffith Park. I happened to mention "valley talk" ("uptalk") but none of us could do a good job of talking like a teenage girl from the valley. That's a shame because now it looks like Valley girl speak is, like, on the rise! I believe it. Not only have I heard girls speak like this on the university campus here in Toronto but I've even heard this language in Ottawa and that's about as far away from California as you can get. I hope my granddaughter and grandson don't grow up speaking like this. They live in Los Angeles. Have you ever seen the Grand Canyon? Did it make you believe in god? Last year we took a helicopter ride to the Grand Canyon [The Magic Canyon Ride ]. None of us converted to Christianity or any other religion. We may be the exception. According to Time magazine, "It’s hard to be an atheist when you’re looking at the Grand Canyon." 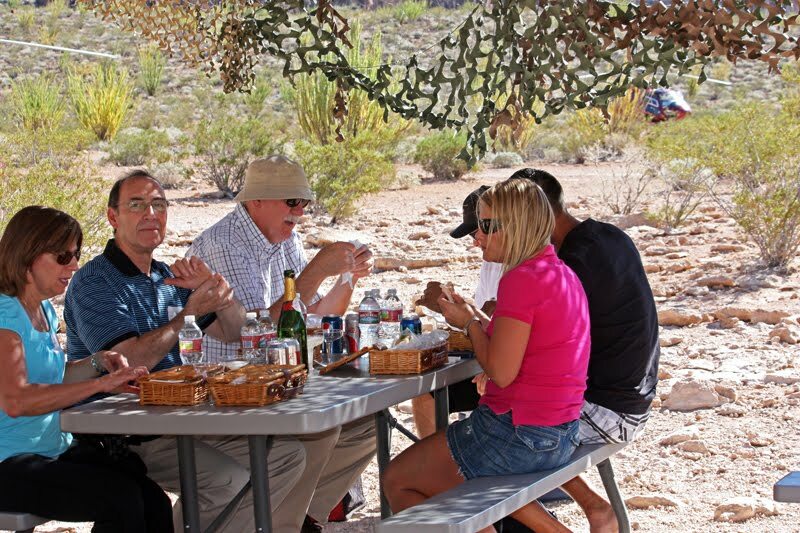 See what Friendly Atheist has to say about this: Time Magazine Says ‘There Are No Atheists at the Grand Canyon,’ Claims that ‘Awe Equals Religion’. My son and daughter-in-law took a mule ride down into the Grand Canyon. I don't think they were converted either. Are there any former atheists out there who were converted by the Grand Canyon? Which god(s) did you choose? "Die, selfish gene, die!" is the provocative title of an article by science writer David Dobbs [Die, selfish gene die!]. The selfish gene is one of the most successful science metaphors ever invented. Unfortunately, it’s wrong. The article attracted the attention of Jerry Coyne who effectively dismantles the strange ideas promoted by Dobbs. Read all about it at: David Dobbs mucks up evolution, part I and David Dobbs mucks up evolution, part II. As it turns out, this is just another example of a science writer who has been mesmerized by the latest effort to overthrow modern evolutionary theory by some scientist promoting their own work. In this case it's Mary Jane West-Eberhard. But there's a more serious issue here and I'm not sure that Jerry Coyne recognizes it. The selfish gene metaphor can be interpreted in several different ways. Here's how Richard Dawkins describes it in the preface to the 1989 edition of The Selfish Gene. The selfish gene theory is Darwin's theory, expressed in a way that Darwin did not choose but whose aptness, I should like to think, he would instantly have recognized and delighted in. It is in fact a logical outgrowth of orthodox neo-Darwinism, but expressed as a novel image. Rather than focus on the individual organism, it takes a gene's-eye view of nature. Lot's of people misunderstand the selfish gene metaphor. They think it means that organisms behave selfishly but that's not what Dawkins meant at all. As Dawkins shows clearly, the "selfish" gene is a metaphor for how natural selection works. Genes act as if they're selfish molecules: those that produce better adaptations act as if they're elbowing out other genes in the battle for future existence. And, to be sure, selfish genes can produce selfish behaviors. But there is also a huge scientific literature on how evolution can favor genes that lead to cooperation, altruism, and even morality. There are two main criticisms of the selfish gene metaphor and both of them are quite valid. It's the reason why Dawkin's view hasn't caught on the the evolutionary biology textbooks. It usually merits nothing more than a footnote. The most damning criticism comes from evolutionary biologists who point out that the primary unit of selection is the individual and not the gene. Stephen Jay Gould and Richard Lewontin are prominent opponents of what they see as an unnecessary reductionism in Dawkins' writing. Clearly, hierarchical theory (Gould) is inconsistent with the selfish gene metaphor because evolution can also operate at the level of groups and species (according to Gould and others). There are plenty of other evolutionary biologists who object to selfish genes for these reasons. The second objection comes from the focus on natural selection and "Darwinism" (or neo-Darwinism). Many evolutionary biologists have a pluralistic view of modern evolutionary theory. That view includes random genetic drift where the appropriate metaphor might be "lucky gene" or "accidental gene." The problem with the Dawkins' metaphor, according to these critiques, is not that "selfish genes" don't exist, it's that the metaphor is not appropriate for evolution in general. Let me add one thing, though. I’m constantly puzzled these days by how often people argue that the neo-Darwinian synthesis is wrong, and that we need a new paradigm. Genetic assimilation, epigenetics, horizontal gene transfer—all of these buzzwords are evoked as reasons to jettison our “conventional” view of evolution. But always, when you look at the data, the evidence that these phenomena will overturn neo-Darwinism is nonexistent. I’ve already written a lot on the epigenetics hype, and have shown that there’s no evidence that a single adaptation in nature involves the fixation in the DNA of an epigenetic alteration of the genome that isn’t initially inherited. Yet people keep banging on about epigenetics. I’m not sure why the hype continues, but perhaps it has to do with the fact that the main paradigm of evolution—the neo-Darwinian synthesis—is largely consolidated, and is correct. Sure, there are surprises to come, and interesting new phenomena, but there’s no “quantum mechanics” of evolution on the horizon. Some theories don’t need to be overthrown because they’re generally right. Perhaps people don’t like working in a field where there’s no new “paradigm” to forge, and Kuhn has ruined us all! The "neo-Darwinism is dead" trend may have to do with ambition, or perhaps with boredom. I don’t know. What I do know is that the many recent challenges to neo-Darwinism have all failed to hold water, but people keep pouring liquid into that sieve. The problem here is that Jerry doesn't really say what he means by "neo-Darwinism." 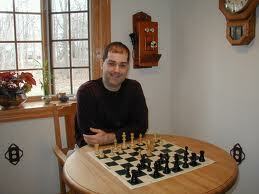 Most of his writing suggests that he's talking about natural selection, albeit updated by a knowledge of genetics. He does mention, from time to time, random genetic drift and other aspects of modern evolutionary theory but I'm not sure if he appreciates the fact that some legitimate evolutionary biologists really do think that neo-Darwinism is dead. Here's the Wikipedia description of neo-Darwinism. It illustrates the problem. Neo-Darwinism is the 'modern synthesis' of Darwinian evolution through natural selection with Mendelian genetics, the latter being a set of primary tenets specifying that evolution involves the transmission of characteristics from parent to child through the mechanism of genetic transfer, rather than the 'blending process' of pre-Mendelian evolutionary science. 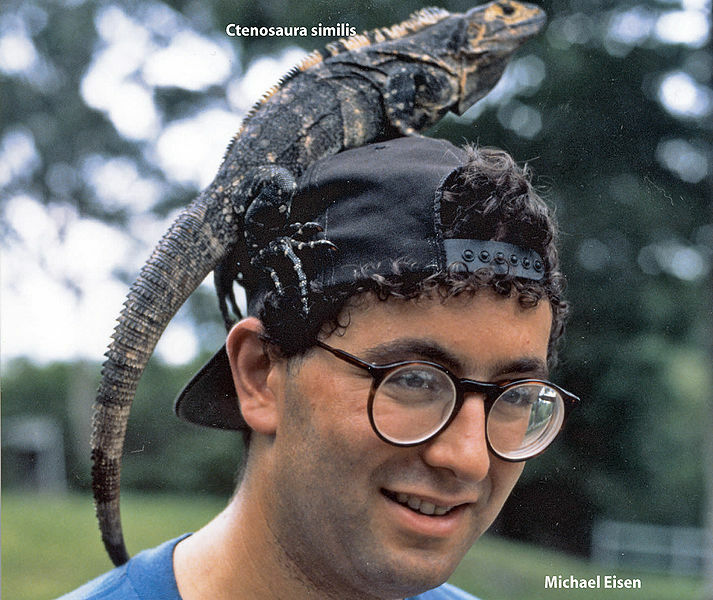 Neo-Darwinism can also designate Darwin's ideas of natural selection separated from his hypothesis of Pangenesis as a Lamarckian source of variation involving blending inheritance. I think we should refer to modern evolutionary theory as "modern evolutionary theory" in order to make sure we're not talking about "Darwinism," "neo-Darwinism," or the hardened version of the "Modern Synthesis." Modern evolutionary theory includes an important role for random genetic drift, Neutral Theory, and population genetics. We could clarify a lot of discussion if we stopped talking about extending "Darwinism" or extending the Modern Synthesis or proclaiming once again that the selfish gene has died. In fact, the selfish gene has died, it died almost thirty years ago but most people don't know that. RIP. 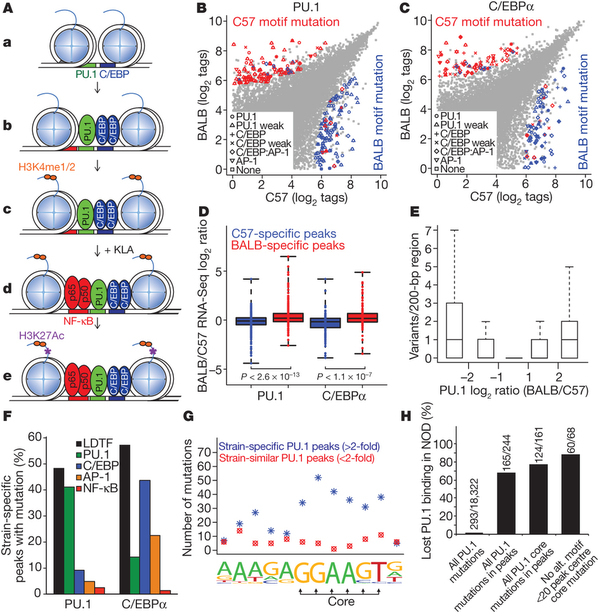 I've published a few papers on the regulation of transcription of a mouse gene and students in my lab have done the standard promoter-bashing experiment to define transcription factor binding sites. I did ny Ph.D. in a lab that specialized in DNA binding proteins. I've kept up with the basic ideas in eukaryotic gene expression in order to teach undergraduate courses on that topic and in order to write appropriate information in my textbook. I've been interested in genome organization for several decades and I've been following the literature on pervasive transcription and transcription factor binding in whole genome studies. I'm reasonably familiar with the techniques although I've never done them myself. I'm not bragging; I'm just saying that I know a little bit about this stuff so when I saw this paper in one of the latest issues of Nature I decided to look more carefully. Jason Rosenhouse read Chris Mooney's article on 7 Reasons Why It's Easier for Humans to Believe in God Than Evolution and liked it. Mooney was arguing that it's easier to believe in god(s) than in evolution because our evolutionary history selected for traits that predisposed us to think more like IDiots than like scientists. Dr. Havas’s research since the 1990s is concerned with the biological effects of electromagnetic pollution including radio frequency radiation, electromagnetic fields, dirty electricity, and ground current. She works with diabetics as well as with individuals who have multiple sclerosis, tinnitus, chronic fatigue, fibromyalgia and those who are electrically hypersensitive. 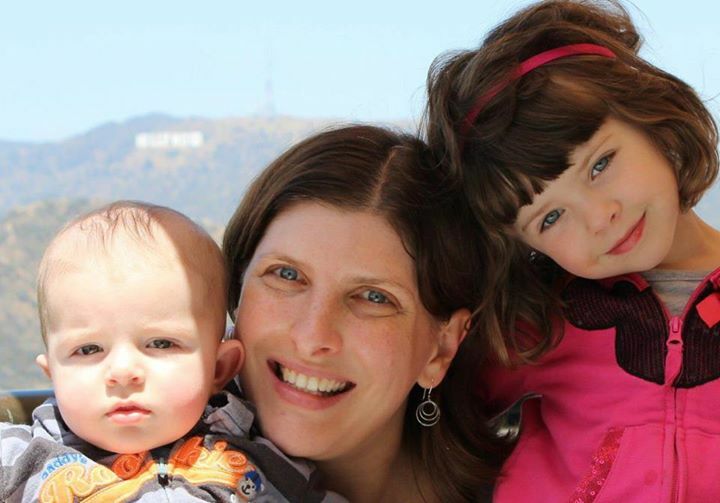 She also conducts research on sick building syndrome as it relates to power quality in schools. Since the mid 1990s Dr. Havas has taught about electromagnetic pollution in several courses at Trent University and has supervised Reading Courses and Honours Thesis Projects in this area. One of the courses deals specifically with the biological effects of electromagnetic fields and electromagnetic radiation. This is one of the few courses available in North America at a senior undergraduate level critically examining the effects of non-ionizing radiation. Here comes the fun part. She has made a video in which she explains why we need to pay attention to all the scientific studies showing harmful effects of power lines, cell phones, WiFi etc. She uses Popper's criterion of falsifiability to justify her rejection of all articles that show no harmful effect and she turns cherry-picking completely upside down to support .... cherry-picking! Don't you just love the title of this video? In case you don't get it, here's a bit of extra reading. Is there any reliable scientific evidence that genetically modified food poses a health risk? 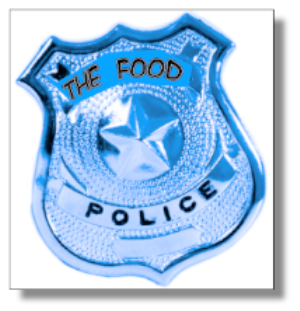 I recently had a discussion about the safety of food derived from genetically modified organisms. My opponent, whose identity I will conceal (hi Rachel! ), argued that GM foods are unsafe and that there's scientific evidence to back this up. Naturally, this evidence is being concealed by Monsanto and other private companies in the same way that tobacco companies tried to hide the evidence that smoking causes lung cancer. My position is that I'm not aware of any reliable scientific studies showing that GM foods are dangerous to your health and, furthermore, in a free and open democracy with a free press it seems highly unlikely that such evidence is being suppressed. It seems even more unlikely that scientists would be part of this conspiracy. The US Food and Drug Administration has asked 23andMe to stop marketing their genetic test product. The company will test your DNA for the presence of several genetic markers that might indicate a predisposition to disease. The FDA is concerned that 23andMe is not doing enough to ensure that its tests are accurate and the advice it gives is medically sound. 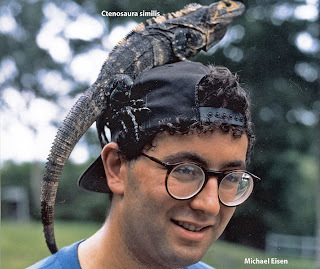 Michael Eisen is on the Scientific Advisory Board for 23andme. He responds to the controversy: FDA vs. 23andMe: How do we want genetic testing to be regulated?. I think some of his points are worth discussing. My position is that the links between certain diseases and certain SNPs are not well-established. The scientific literature on this topic is not all that great and many of the published results have not been repeated. What this means is that private companies like 23andMe are under pressure to be the first to include a new link in their database but may not be exercising the appropriate amount of skepticism. How do creationists interpret Lenski's long-term evolution experiment? Lenski's long-term evolution experiment has resulted in dozens of publications in high quality journals. It has led to significant insights into evolutionary processes [e.g. Lenski's long-term evolution experiment: the evolution of bacteria that can use citrate as a carbon source]. You may be wondering how Intelligent Design Creationists react to these results since most IDiots have a natural aversion to evidence. 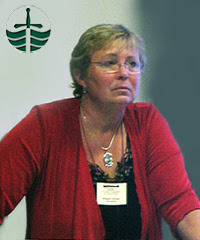 Denyse O'Leary wasn't impressed [The Latest From Lenski’s Lab]. She doesn't know very much about science so she has to rely on the opinions of other IDiots. 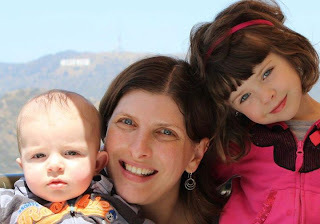 In this case, she relies on Ann Gauger who published a comment on the website of The Biologic Institute [Inovation or Rennovation]. Richard Lenski set up twelve flasks of E. coli B back in 1988. They were allowed to grow overnight in minimal medium containing 139μM glucose and 1,700 μM citrate. The glucose was the only carbon source that the parent strain could use and it limited growth of the cultures. The citrate was present as a standard chelating agent. The bacteria could not take up citrate and use it as an additional carbon source. Every day the culture was diluted by transferring one ml to 99 ml of fresh medium (1/100). There were 6.64 generations per day or 2,423 generations per year (slightly more in a leap year). These cultures were under strong selective pressure. Individual bacteria that could grow faster would out-compete other bacteria in the culture and take over. Lenski expected that each culture would show a variety of different solutions to the selective pressure with many common mutations and many that could be unusual. Ask a stupid question ... can anyone guess the answer? I just love the IDiots. They never cease to amaze, and amuse, me. Here's the latest from David Klinghofer at: Intelligent Design as an Orange Flag. The mention of ID seems to give many writers and commentators what they regard as a green light to blather on without taking a moment to grasp what they're writing about. Denouncing ID is one thing. Denouncing it without comprehending what the phrase refers to, which is amazingly common, is quite another. I continue to find this amazing. What other subject, both controversial and somewhat recondite, seems to license apparently smart people to write and speak in such an uninformed way? Can anyone think of such a subject? Was Louis Agassiz better in the concrete? Back in the nineteenth century (i.e. more than one hundred years ago) there was a biologist named Louis Agassiz who didn't like Darwin's radical ideas about evolution. Agassiz, a very famous professor at Harvard, thought that there were major gaps n the fossil record and he lamented the apparent lack of transitional fossils. What he was looking for were fossils of direct ancestors of modern species and not their close cousins. Stephen Meyer thinks this old debate is still relevant today so he writes it up in Darwin's Doubt as if nobody in the past one hundred years ever thought of an explanation. It fooled Denyse O'Leary (not hard) so she blogged about it today [Louis Agassiz: The selective incompleteness of the fossil record]. This reminds me of a famous photograph of the statue of Louis Agassiz embedded upside down in the courtyard in front of the zoology building at Stanford University. 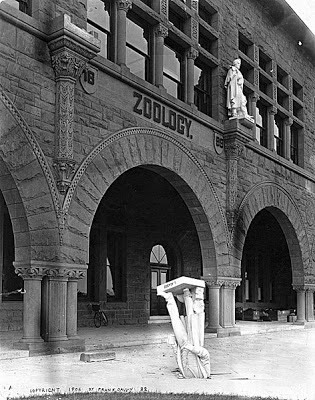 The statue tumbled from its place above the entrance during the San Francisco earthquake of 1906. 1. The story is apocryphal (a polite word for "false"). The quotation has been attributed to several men, including the President of Stanford, but all have denied it. Nevertheless, it's too good a story to abandon just because it happens to be untrue! 2. Stephen Jay Gould held the Alexander Agassiz Professor of Zoology Chair at Harvard from 1982 until his death in 2002. Alexander Agassiz was Louis Agassiz's son. Alexander served as President of the National Academy of Sciences. Last week's molecule was EF-Tu (elongation factor-thermo unstable). EF-Tu binds to all tRNA molecules in the cell and helps position them in the A-site of the ribosome-mRNA complex during protein synthesis. Its release is coupled to GTP hydrolysis. Eukaryotes contain homologous proteins with different names (e.g. EF-1α). The winner was Jon Nuelle from Texas. The undergraduate winner was Ariel Gershon for the second week in a row. Today's molecule (below) is an intermediate in a very important pathway that's only found in some species. This is one of those times when you need to supply the common name AND the correct scientific name that specifies the exact molecule shown in the figure. Email your answer to me at: Monday's Molecule #225. I'll hold off posting your answers for at least 24 hours. The first one with the correct answer wins. I will only post the names of people with mostly correct answers to avoid embarrassment. The winner will be treated to a free lunch. This month's Carnival of Evolution is hosted by none other than John Wilkins. He's a philosopher but don't let that put you off. He blogs at Evolving Thoughts although from time to time he threatens to stop blogging. Encourage John by visiting The Day of the Doctor of Evolution: CoE #66. The "Doctor" in the title is a reference to Dr. Who. Apparently John watched the first episodes in 1963!! "Who" knew that he was even born in 1963? If you can't name the blue thingy on the right then you probably never win trivia games. If you want to host a Carnival of Evolution please contact Bjørn Østman. Bjørn is always looking for someone to host the Carnival of Evolution. He would prefer someone who has not hosted before but repeat hosts are more than welcome right now! Bjørn is threatening to name YOU as host even if you don't volunteer! Contact him at the Carnival of Evolution blog. You can send articles directly to him or you can submit your articles at Carnival of Evolution although you now have to register to post a submission. Please alert Bjørn or the upcoming host if you see an article that should be included in next month's. You don't have to be the author to nominate a post. Elizabeth Pennisi has written about the long-term evolution experiment of Richard Lenski [The Man Who Bottled Evolution]. The experiment is in it's 25th year and it is entirely appropriate that Science magazine devotes several pages to describing the results. There have been some remarkable discoveries. Lenski's humble E. coli have shown, among other things, how multiple small mutations can prepare the ground for a major change; how new species can arise and diverge; and that Gould was mistaken when he claimed that, given a second chance, evolution would likely take a completely different course. Most recently, the colonies have demonstrated that, contrary to what many biologists thought, evolution never comes to a stop, even in an unchanging environment. Let's talk about two issues in that paragraph.